Photo courtesy of Darco International. 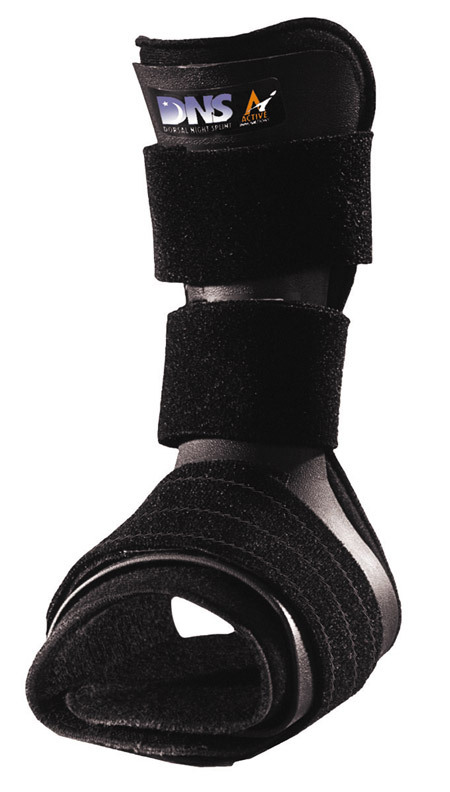 Both the traditional adjustable night splint and a dorsal night splint improved plantar fasciitis pain in a retrospective study, with results trending in favor of the dorsal design, which provides less stretch but may improve patient compliance. By Selene G. Parekh, MD, MBA, Olubusola A. Brimmo, MD, Ryan May, BS, and Bret C. Peterson, MD. The treatment of plantar fasciitis aims at affecting the anatomical, biochemical, and environmental factors that may contribute to the development of the condition. Conservative treatment can be effective, as demonstrated in the literature, and is the initial treatment of choice.8, 9 Treatments should address any gastrocnemius-soleus complex tightness through stretching and an eccentric-based strengthening program.10 The associated inflammatory process should be a less important focus, as nonsteroidal anti-inflammatory drugs and steroid injections have failed to show long-term benefits.11 It is believed that night splints act to place the ankle in anatomical position such that nocturnal contractures of the gastrocnemius-soleus complex is reduced and further tension on the complex, which is thought to be unfavorable to plantar fascial healing, is avoided.12 This can be performed with a traditional adjustable night splint or more recently, with dorsal night splinting. Previous studies have compared various methods of conservative treatment of plantar fasciitis against one another, but to our knowledge there is no study comparing the treatment of plantar fasciitis between two different types of night splints in the peer reviewed literature. In this retrospective study we sought to determine the clinical benefit of applying a dorsal night splint and to compare it to an adjustable night splint in treating plantar fasciitis. Records of patients who were treated for plantar fasciitis with either dorsal night splints or adjustable night splints between September 2006 and August 2008 were retrospectively reviewed after obtaining IRB approval. The diagnosis of plantar fasciitis and determination of pre- and post-treatment scores on the American Orthopaedic Foot & Ankle Society Ankle-Hindfoot Scale were established through a consistent method of history, physical exam, and radiographs by the senior author during clinic visits with 170 patients during this time frame. All patients were randomized by entry into practice—patients received the dorsal night splint based on entry into the clinic during the first year and the traditional adjustable splint for entry during the second year of the study. From September 2006 to August 2007, all patients diagnosed with plantar fasciitis by the senior author were placed in a dorsal night splint, enrolled in physical therapy, and given silastic heel cups. From September 2007 to August 2008, all patients diagnosed with plantar fasciitis by the senior author were placed in a traditional adjustable night splint, enrolled in physical therapy, and given silastic heel cups. All patients in both study groups were given the same prescription for formal and home-based eccentric Achilles exercises and stretching, as well as massage, iontophoresis, and ultrasound. No orthotics or corticosteroid injections were given. Patients’ records were reviewed for the date of onset of splint treatment and the date symptoms resolved, the side on which the splint was used (right or left foot), age and gender of the patient, and the presence of a calcaneal stress fracture. Patients with a calcaneal fracture were excluded (41 patients), as were patients with metatarsal stress fractures and all other patients with other unrelated or concomitant foot diagnoses. Patients with partially locked records as established by university rules and regulations were also excluded (four patients). 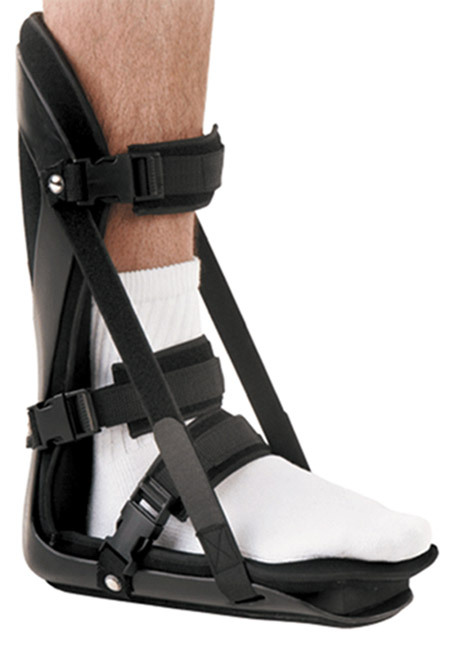 The traditional adjustable night splint used in this study has adjustable flexion straps and adjusts from 10° to 90° of dorsiflexion (Figure 1a). The dorsal night splint has a rigid support on the dorsum of the foot and ankle (Figure 1b), but does not provide the same range of adjustable dorsiflexion as the traditional night splint, instead ranging from neutral to 5° of dorsiflexion. Although the dorsal night splint does not provide as much of a stretch as an adjustable device, the dorsal design is thought to be more comfortable, which could improve patient compliance. 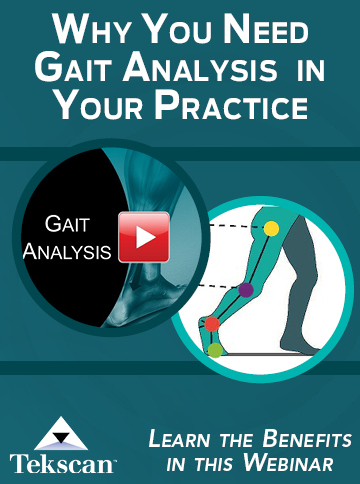 Of the 170 patient records reviewed, 125 were analyzed after excluding the patients with calcaneal stress fractures and partially locked records. The average patient age was 51.3 years. Of the 125 patients, 79 were male (63.2%) and 46 female (36.8%). Eighty-seven used adjustable night splints (69.6%) and 38 used dorsal night splints (30.4%). Two patients had metatarsal stress fractures (Table 1). The average age of patients who used the traditional adjustable night splints was 49.5 years, while the average age of patients who used dorsal night splints was 55.6 years (p= 0.021, two-sample t-test). Of the patients who used dorsal night splints, 44.7% were male (n=17), and 55.3% were female (n=21). Of the patients who used traditional adjustable night splints, 33.3% were male (n=29), and 66.6% were female (n=58). Of the patients who used dorsal night splints, 47.4% were treated on the left foot (n=18), and 52.6% were treated on the right foot (n=20). Of the patients who used traditional adjustable night splints, 42.5% were treated on the left foot (n=37), and 57.5% were treated on the right foot (n=50). There were no statistically significant differences in gender or side between the dorsal night splint group and the adjustable night splint group (Table 2). The overall average pre-treatment AOFAS hindfoot score was 77.3 out of a possible 100 points and average post-treatment AOFAS hindfoot score was 91.2 (average score change was 13.9). The average time for resolution of symptoms was 119.5 days (Table 3). The average increase in AOFAS score from initial treatment to post treatment was 12.5 when using an adjustable night splint compared with 17.1 when using a dorsal night splint. Controlling for age, this change was not found to be statistically significant (p= 0.146, ANOVA). The average time taken until symptoms resolved using an adjustable night splint was 118.6 days (median 84 days) compared with 108.3 days (median 49 days) in patients who used a dorsal night splint, a difference that was not statistically significant (p = 0.260, ANOVA model, log transformation on time to resolution). The plantar fascia is a thickened fibrous aponeurosis that originates from the medial and lateral tubercles of the calcaneus and runs forward into the proximal phalanges to form the longitudinal foot arch. The function of the plantar fascia is to provide static support of the longitudinal arch and dynamic shock absorption. Plantar fasciitis is considered a self-limited condition, with symptoms resolving in 80% to 90% of cases within 10 months.8 The literature-based natural history of plantar fasciitis serves as a historical “control” group to which this study’s splinting techniques are compared. In most cases, plantar fasciitis will respond to multiple modalities of conservative measures.11 In one long term follow up study, investigators found that 80% of patients treated conservatively for plantar fasciitis had complete resolution of pain after four years.8 If it is left untreated, it may lead to further calcification of the plantar calcaneal tuberosity where the plantar fascia and intrinsic muscles are attached, which leads to a condition known as “heel spur syndrome.” This condition induces greater pain than plantar fasciitis and is difficult to treat.5 Common predisposing factors for plantar fasciitis include obesity, female gender, middle age and excessive pronation, which can lead to fascial damage and secondary gastrocnemius-soleus contracture as well as contracture of the intrinsic muscles, especially the flexor digitorum brevis. The primary goal of treatment should be to place the fascia at proper length to heal during both weightbearing and nonweightbearing activities. In a previous study, night splints were cited as the best treatment by approximately one third of the patients with plantar fasciitis.11 Night splints usually are designed to keep a person’s ankle in a neutral or slightly dorsiflexed position overnight. Most individuals naturally sleep with the feet plantar-flexed. Bedding on the dorsal aspect of the foot further accentuates this position through the five to eight hours per night that an individual sleeps. This causes the plantar fascia to remain in a foreshortened position. Theoretically, night splints should resist secondary nighttime contraction of the gastrocnemius-soleus complex and intrinsic musculature, as well as gravitational forces, which act to place the fascia in a shortened position. 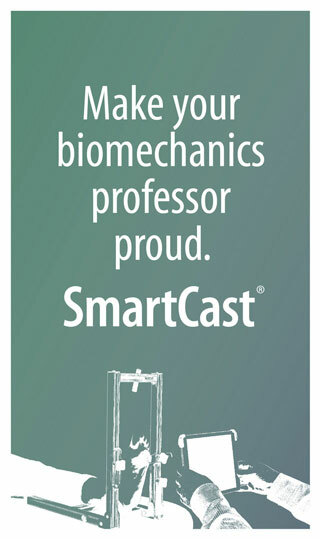 This is accomplished by placing the foot at 90° to the ankle and applying mild dorsiflexion to the digits to utilize the pulley properties of the plantar fascia. Maintaining the proper length of the plantar fascia during the healing period prevents the fascia from healing in a shortened position, which could cause further pain while weightbearing. Our study shows a decreased time for resolution of symptoms in patients who used the dorsal night splints (median 49 days/ average 108.3 days) when compared with patients who used the adjustable night splints (median 84 days/ average 118.6 days). There was also a higher average increase in AOFAS scores in the patients who used dorsal night splints (17.1) compared with adjustable night splints (12.5). Roos et al performed a prospective randomized trial comparing use of foot orthoses, foot orthoses and night splints, and night splints alone, concluding that foot orthoses and anterior night splints were effective for both short- and long term treatment of plantar fasciitis at 12 weeks and 52 weeks. The study did not reach statistical significance and called for further evaluation of treatment measures and direct comparisons of splint types.15 Our study reveals that there is a trend towards higher efficacy of dorsal night splints over adjustable night splints in the treatment of plantar fasciitis. Although the results of this study were not significant, we believe that follow up prospective randomized controlled studies with a larger cohort population may yield significant results in comparing outcome and efficacy of night splints. Selene G. Parekh, MD, MBA is an associate professor in the department of orthopaedics at Duke Medical Center in Durham, NC. Olubusola A. Brimmo, MD, recently completed a junior trauma fellowship at the St. Louis University School of Medicine in St. Louis. Ryan May, BS, is in the department of biostatistics at the University of North Carolina at Chapel Hill. Bret C. Peterson, MD, is a fourth year resident in the department of orthopaedic surgery at Duke University Medical Center. Neufeld SK, Cerrato R. Plantar fasciitis: evaluation and treatment. J Am Acad Orthop Surg 2008;16(6):338-346. Powell M, Post WR, Keener J, Wearden S. Effective treatment of chronic plantar fasciitis with dorsiflexion night splints: a crossover prospective randomized outcome study. Foot Ankle Int 1998;19(1):10-18. Riddle DL, Pulisic M, Pidcoe P, Johnson RE. Risk factors for plantar fasciitis: a matched case-control study. J Bone Joint Surg Am 2003;85(5):872-877. Lee SY, McKeon P, Hertel J. Does the use of orthoses improve self-reported pain and function measures in patients with plantar fasciitis? A meta-analysis. Phys Ther Sport 2009;10(1):12-18. Beyzadeoglu T, Gokce A, Bekler H. [The effectiveness of dorsiflexion night splint added to conservative treatment for plantar fasciitis]. Acta Orthop Traumatol Turc 2007;41(3):220-224. Wolgin M, Cook C, Graham C, Mauldin D. Conservative treatment of plantar heel pain: long-term follow-up. Foot Ankle Int 1994;15(3):97-102. Dyck DD Jr, Boyajian-O’Neill LA. Plantar fasciitis. Clin J Sport Med 2004;14(5):305-309. Batt ME, Tanji JL, Skattum N. Plantar fasciitis: a prospective randomized clinical trial of the tension night splint. Clin J Sport Med 1996;6(3):158-162. Glatter RD. Plantar fasciitis: evidence-based management. Medscape Emergency Medicine; October 2007. 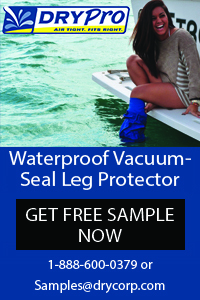 Available at: http://www.medscape.com/viewarticle/562437. Accessed August 4, 2010. Alfredson H, Lorentzon R. Chronic Achilles tendinosis: recommendations for treatment and prevention. Sports Med 2000;29(2):135-146. Barry LD, Barry AN, Chen Y. A retrospective study of standing gastrocnemius-soleus stretching versus night splinting in the treatment of plantar fasciitis. J Foot Ankle Surg 2002;41(4):221-227. Wapner KL, Sharkey PF. The use of night splints for treatment of recalcitrant plantar fasciitis. Foot Ankle 1991;12(3):135-137. Probe RA, Baca M, Adams R, Preece C. Night splint treatment for plantar fasciitis. A prospective randomized study. Clin Orthop Relat Res 1999(368):190-195. League AC. Current concepts review: plantar fasciitis. Foot Ankle Int 2008;29(3):358-366. Roos E, Engstrom M, Soderberg B. 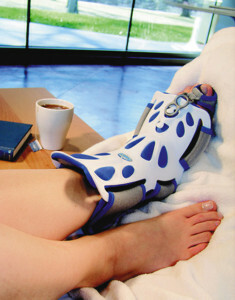 Foot orthoses for the treatment of plantar fasciitis. Foot Ankle Int 2006;27(8):606-611. I am not completely sold on night splints. In conducting cost-effective medicine I have found great results within 4 months without it. I have focused on deep tissue massage of the calf muscles. along with heeled shoes and ice, these three are the mainstay of my 6 part home program. the use of injections have plumetted and I am not doing surgery any more on them.